Want to run 10km? 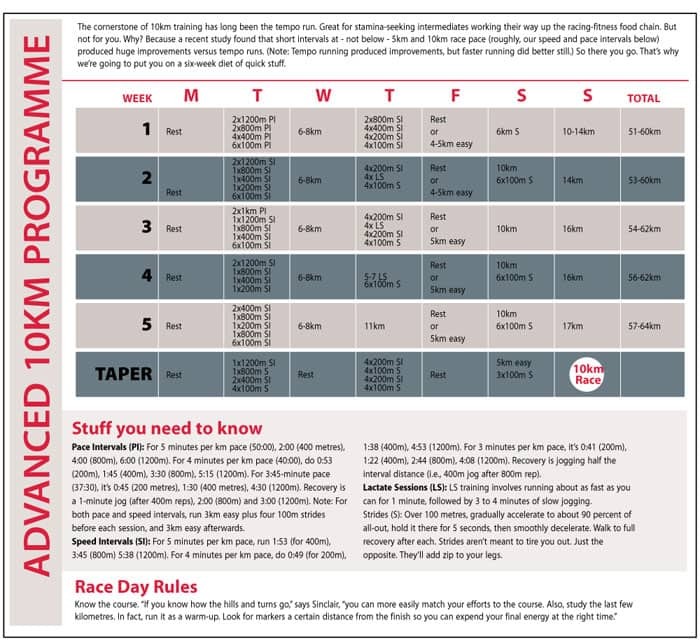 Download your training programme now. You’ll be glad to hear that training for a 10km race forms the foundation of all-round fitness, because it includes ample amounts of the three core components of distance running – strength, stamina and speed. Not only can you use it to train for your goal 10km, but with certain adjustments you can also use it to prepare for everything from a 5km to the marathon. When you race a 10km, you immerse yourself in near-mythical tradition. 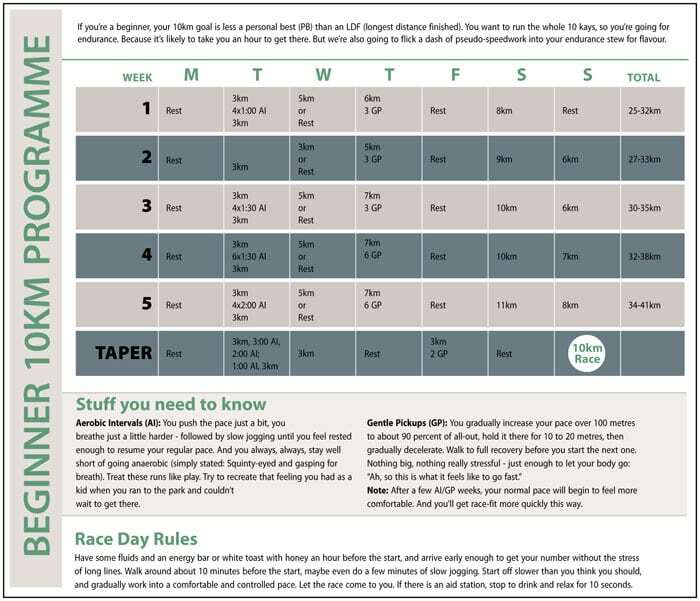 So read through the runner profiles below to determine which of our six-week plans is best for you. And remember: These are not one-size-fits-all plans, so if you can’t complete a given workout, don’t. 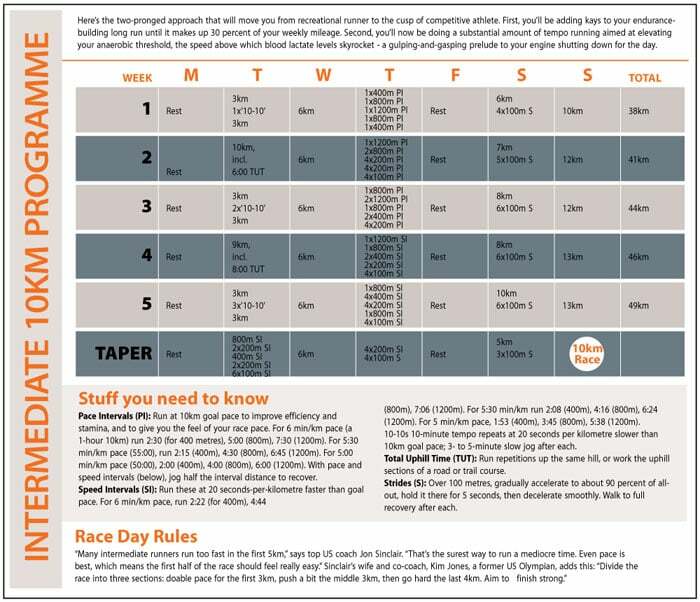 If you need to rearrange training days to fit your schedule, do it. Beginner You’re a notch above novice. You’ve been running at least six months and maybe have done a 5km or two. You run 5-6km three or four days a week, have done a little fast running when you felt like it, and now you want to enter – and finish – what you consider a real distance race. Intermediate You’ve been running a year or more, done some 5km races, maybe even a 10km. But you’ve always finished feeling like you could have gone faster. You consider yourself mainly a recreational runner, but you still want to make a commitment to see how fast you can go. Advanced You’ve been a serious runner for several years, have run many races – perhaps even a marathon. You’re familiar with fartleks and intervals, and can run comfortably for an hour-plus. Now you want a breakthrough time – and you’re willing to put in a rigorous six weeks to achieve it.